Demanding the closing of the India-Bangladesh border and protesting against the jihadi activities in Assam, All Assam Students Union (AASU) on Saturday set up a protest rally in Guwahati. “There is no place for illegal Bangladeshis and other fundamentalists in Assam. We are against jihadis and demand that the Union government and state government seal the Indo-Bangladesh border immediately,” AASU advisor Dr Sammujal Bhattacharjee said. “The Union and state government should be taking [immediate] measures to check the influx in the state,” Dr Bhattacharjee said. He alleged illegal Bangladeshis had encroached in Kaziranga National Park (KNP) and government lands in other parts of the state. “We demand that the migrants issue be settled through the Assam Accord,” the AASU advisor said. 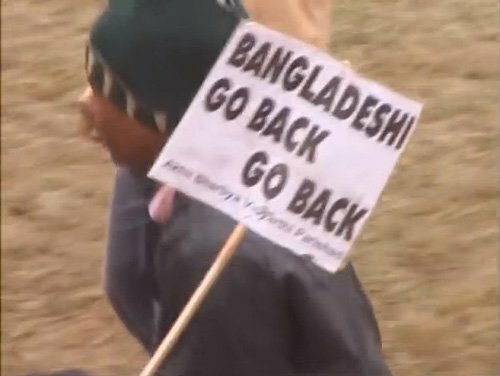 The “Satyagrah” rally started from Latasil field in the city where a gathering of more than 20,000 people protested against the illegal Bangladeshis and jihadi activities in the state.